FOLLOWING a number of issues arising from the access of transport to the new Downe Hospital campus in Downpatrick, a cross-party sub-committee has been set up in Down District Council to address this. It was felt that there had been years of delays in resolving the Roads congestion in the town including improving access to the new Downshire hub formerly the site of the Downshire hospital. 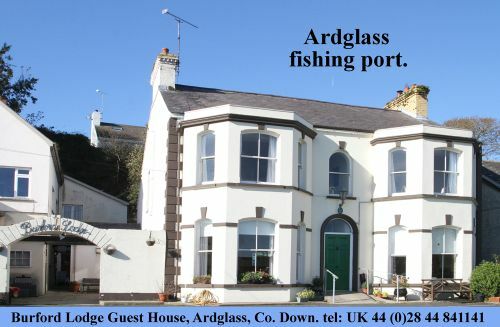 This initiative was spearheaded by Councillors Cadogan Enright and Dermot Curran and has succeeded in making progress if drawing the various agencies together to engage with the issues concerned. 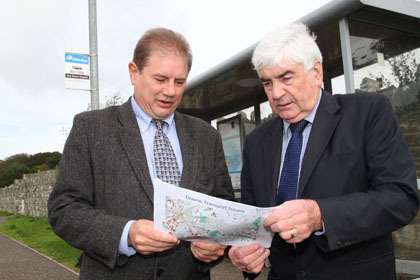 Down District Councillors Cadogan Enright and Dermot Curran look over a map of the Downshire road systems. Councillor Enright said: “At a meeting of Downpatrick Councillors we agreed to campaign on these issues on a cross-party basis. Downpatrick is the only main hub within 20 miles of Belfast not to have benefited from significant investment to ease congestion. The move was supported by Council Chief Executive John Dumigan who appointed a senior Council officer to support the work of the campaigns. Councillor Enright added: “The roads and public transport elements of this project are very complex. They involve Roads Service, Translink, the Health Trust, the Council, all the tenants of the new Downshire hub as well as the emergency services. Having a co-ordinated approach to public sector employment is no less complex. As part of the work of the cross-party committee, the matter of access to the new police station in Downpatrick being located on the Downshire site has been discussed and it is hoped that to ease congestion in Downpatrick, planning permission can be made for a new road linking to the Ballyhornan Road from the Downshire hub site. It is hoped that when the public transport issues have been resolved, there will be a bus servicing the Downshire hub and Down Hospital every 15 minutes. Down News also understands there are issues of funding of the final roads solutions to be resolved. A possible drop off point could be at the rear ground floor door of the new Downe Hospital beside the cafeteria which opens up onto the from of the Downshire estate. Buses could come in through the front Downshire gate and drop off patients, visitors etc close to the hospital, but this option has to be agreed between the agencies.